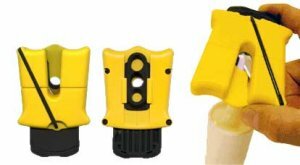 The Spout Popper is a small Guillotine type cutter that is specifically designed to cut open caulking and similar type adhesive tubes. The Spout Popper offers 3 bead sizes to choose from via an adjustable selector, and also features a built in seal puncturer. It uses standard utility knife blades as the cutter blade, so you never have to worry about finding replacements. I usually don't care for unitask tools, but I think this tool has its place for painters, and other trades that do a large amount of caulking. The best part is that you can buy one Spout Popper and keep it next to your box of caulking so the whole crew can use it.